I started a new job recently and when one of my colleagues did a quick google-stalk on me (it’s cool….that’s just standard operating procedure these days) she discovered that I’m a writer. She even went so far as to read a couple of my blogs. Now, this lovely, intelligent, obviously astute woman was not the first person to tell me she enjoyed my writing, but she was one of the few that isn’t a close friend a relative or an easily bribed critic. Her words had a greater impact on me than those who know and love me because, yeah, like I’m really going to listen to the people who didn’t say a damn word about that mullet I rocked through my college years. 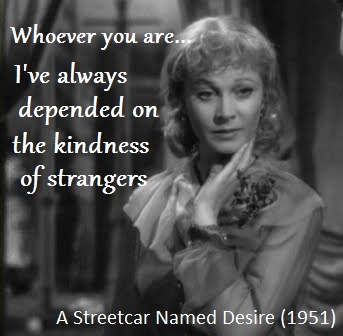 My next thought, quite naturally, went to Blanche Dubois from the play A Streetcar Named Desire. You have the most gorgeous baby! That’s a beautiful scarf you’re wearing! You have an amazing smile! Hey, you are really rocking that mullet! Go be a stranger to someone today. Not the creepy windowless conversion van kind of stranger, but the kind of stranger who just says something nice to someone that they don’t know very well or maybe even don’t know at all. Go make someone’s day. That’s some incredible power we all have. We have stranger power. I was searching for the Streetcar quote and stumbled upon this blog post. I didn’t help anyone today, but two strangers helped me! My key wouldn’t turn in my car’s ignition in the parking lot of a public building. One man tried to help and got another man to bring some spray to unstick the key. It worked enough to get me home, and it helped restore some of my faith in humanity. Little kindnesses matter so much.